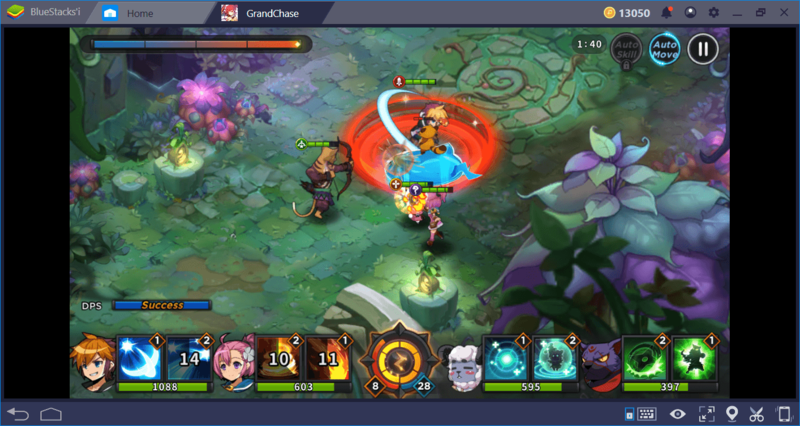 GrandChase has a very dynamic combat system: You must always keep an eye on your screen and act accordingly. Once the combat starts, you need to use your skills as a chain and avoid AOE (area of effect) attacks of enemies. Otherwise, even the lowest level enemies can kill your heroes in a short time. If you have not played an action RPG game that uses telegraph mechanics before, the battle system can be quite challenging. Moreover, you need to pay attention to the role distribution when setting up your party. Don’t worry: After reading this guide, you’ll be able to easily conquer the battlefields of Elyos. To embark on an adventure, you must first establish a party. 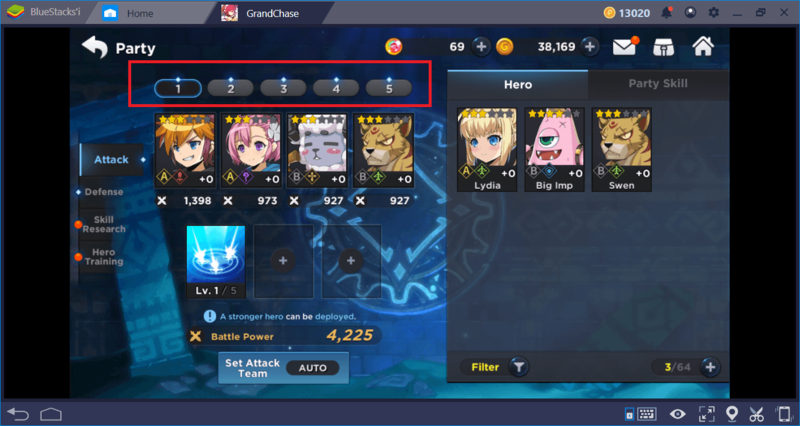 A party can host 4 heroes and you can create up to 5 parties in total. Each party can be created for a different purpose. For example, you can set one party for PvE missions, and another for PvP tasks. You can switch from one party to another from the “party management” screen. Another thing to be aware of on this screen is the selection of the “party skill” at the bottom. We’ll give more details about this below. For now, however, know that you can choose different party skills and this selection should be appropriate to the mission you plan to do. For example, if you are going to fight against a tough boss, it may be a better idea to use “Healing Touch” or “Resurrect” party skills. Each party can choose from a total of 11 party skills. 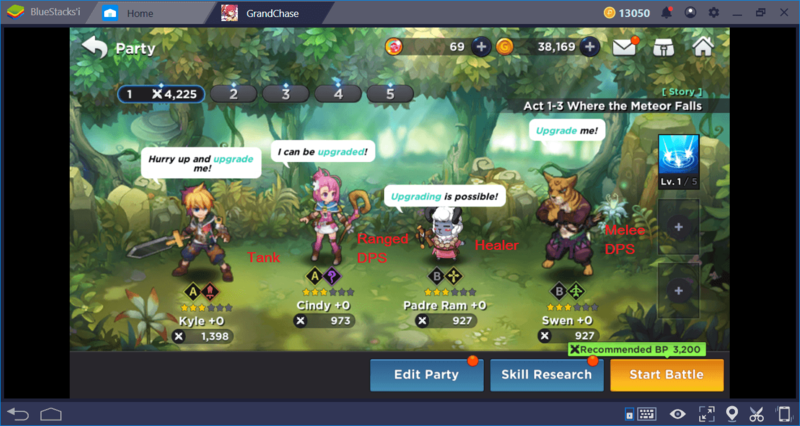 If you create 5 teams, don’t forget to choose different party skills too. So, how do you know which hero plays what role? 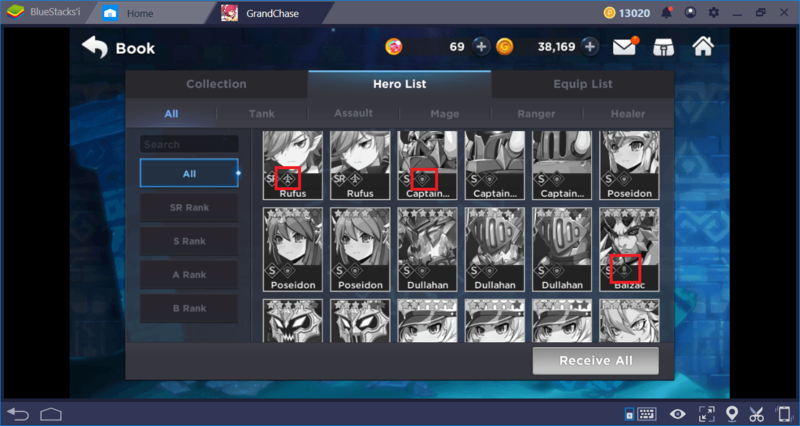 Open your list of heroes and see the icons in the lower left corner of the character portraits. These icons indicate which role the hero is suitable for. Tank: This is the hero you need to manage most actively on the battlefield. Do not let it stand still. Always make sure tank starts the combat and he attacks first. Keep the attention of the enemies on him by constantly moving the tank around the battlefield. Tank heroes have the highest health points. Healer: You don’t need to actively manage healers. Just use your healing skills whenever they come out of cooldown. If the enemies are attacking the healer, use the tank to intervene. Healers have the lowest health points and they can die pretty fast. Melee / Ranged DPS: You don’t need to actively manage these heroes too. DPS characters have the highest attack points. All you have to do is use their skills after they come out of cooldown. They are more durable than a healer, so they can take a little beating. Note that these comments are for PvE missions. PvP activities require a different team setup. For example, you don’t need to add a tank to your party in a PvP battle. In order to participate in every activity in GrandChase, we advise you to establish parties with different characters/roles. Before we explain telegraph mechanics, which is quite an interesting feature, let’s take a look at the battle screen. 1: The skills that your heroes can use. A character can have multiple skills but can use only two on the battlefield. Examine each hero’s skills and choose the ones that will complement each other. You can do this from the “party management” screen. 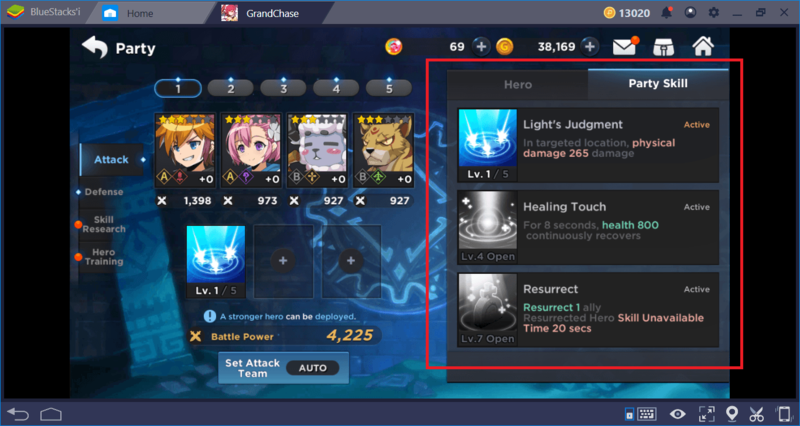 If you click on a skill and wait, its description will be displayed, as shown in the lower right corner. A skill cannot be used for a certain period of time after use, this is called a CD (cooldown) time. 2: Health points of heroes. 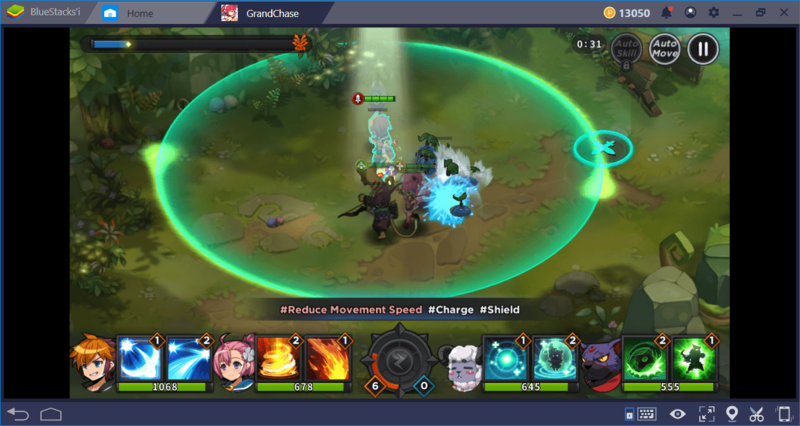 3: “Auto Move” button. If you do not want to constantly click on the ground to direct the heroes, we recommend activating this option. 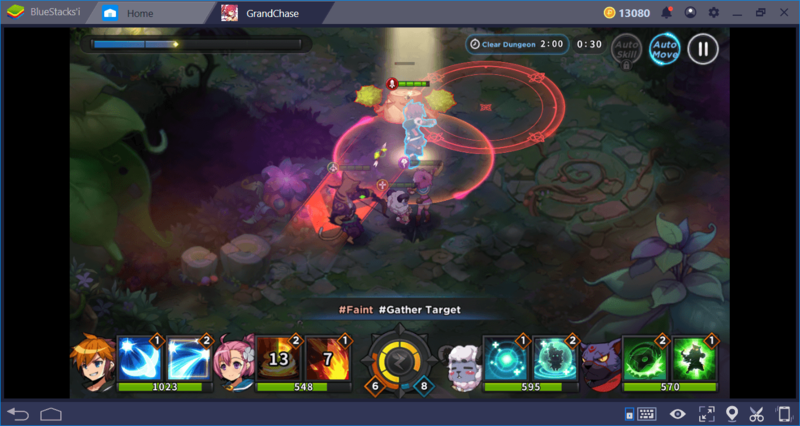 4: “Party Skill” button. 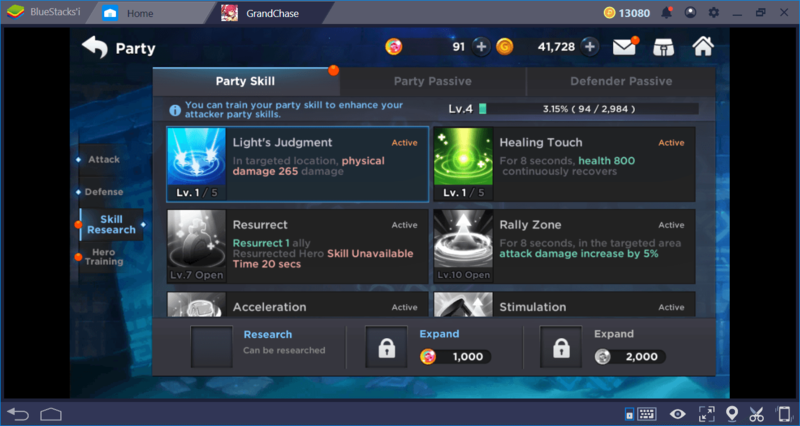 After you use 9 skills in total, you can use the party skill. This button will become active after using 9 skills in total each time, it has no cooldown. 5: Indicates where you are on the mission map. If this line is full, you’re close to completing the mission. You can place this circle anywhere on the playing ground. The diameter of the circle indicates the area where the skill will be effective. You can place more than one circle on the ground on top of each other: In this way, you can create a combo and your attacks will be more effective. If you create such a combo, its effects will appear on the bottom of the screen. So, your goal is to create telegraph circles that are constantly interlocking. If you think your attacks are not effective enough, you probably aren’t creating enough effective combos. 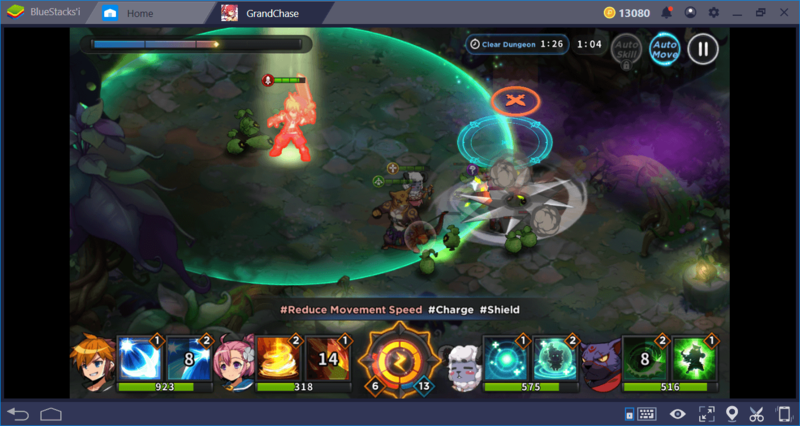 GrandChase combat mechanics require using skills not in order, but at the same time. This way, they can complement each other. In other words, you need to go “nuts” during the battle: Use the skills of your heroes at the same time, and place your telegraph circles inside each other. Otherwise, you won’t be able to beat even the weakest enemies, like we mentioned in our review of the game. You are not the only one who can use telegraph circles: Your enemies can use them too. So, if you see a red telegraph circle on the playing ground, you need to get away from there immediately. 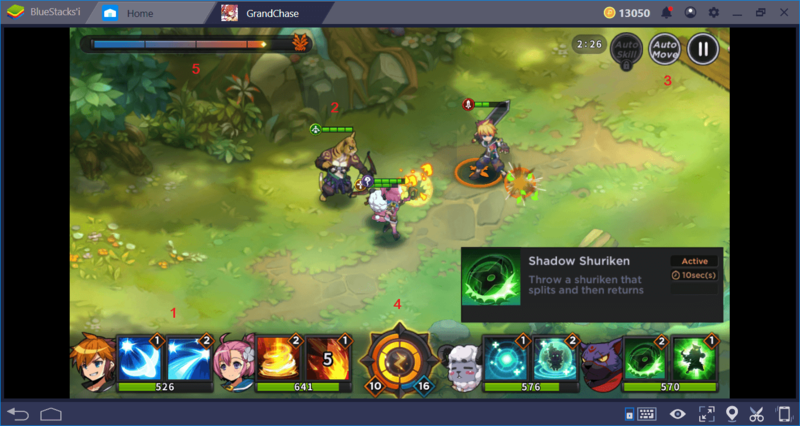 The dynamic game mechanics of GrandChase ask you to be constantly active. Unlike similar games, the tank character doesn’t have a real “taunt” ability – this means he needs to move constantly on the battlefield to gain enemies’ attention. You cannot click on a button and gain the “aggro” of enemies: If they are attacking other party members, you should intervene immediately. Therefore, pay attention to the management of the tank hero: It must be constantly active on the battlefield and he should always be where the enemies are. Finally, don’t forget to do research to learn and strengthen new party skills. Research can be made in exchange for gold, for the first time, and then for gems. When used at the right moment, party skills can help you survive even the toughest battles. 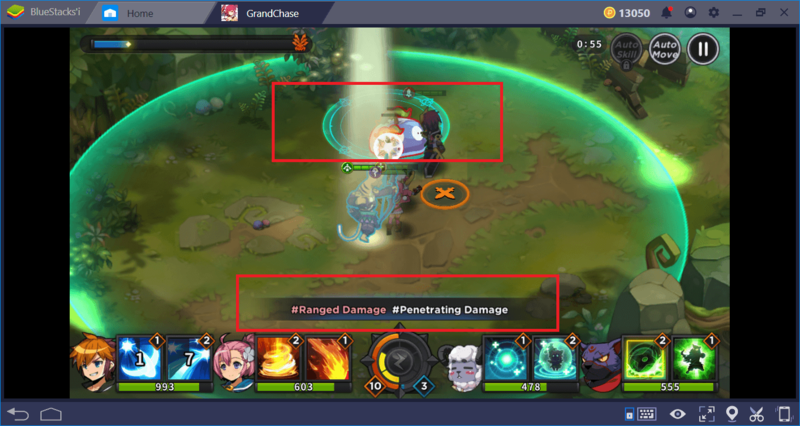 These are the most important things you need to know about GrandChase battle mechanics. Don’t forget to read the guide we prepared about Heroes & Summoning – in that guide, you can find out what you need to do in order to strengthen your party members furthermore. A great adventure awaits you in the world of Aernas and you’re ready to start it now: Good luck!